This post is contributed by Jessica Steinberg, member of our 2014 Travel Team and Board Member at Roots Ethiopia. Jessica will return to Ethiopia next week where she will continue to work closely with school leaders to develop policy around data collection and reporting for each of our programs. The universality of a teachers’ love for their students is something I have witnessed firsthand as I have traveled the world. Many teachers around the world work in less than desirable conditions and are often significantly under-resourced. As a former educator, I understand what it means to have to be innovative in the classroom. Teachers around the world are often underpaid and in the US are also underappreciated. Most public schools are underfunded and lack many basic supplies. Many teachers I know spend a percentage of their paychecks buying supplies for their classrooms and extras resources for their students. Being a resourceful teacher in the US often means the difference between a classroom filled with electronics, learning supplies, and supplemental materials, versus the bare minimum of state-issued textbooks, notebooks, and some writing utensils. It wasn’t until our recent visit to Ethiopia, that I truly saw what a resourceful teacher can do. It was absolutely awe-inspiring to see the number of teachers who took time out of their busy days to meet with us and share their stories. They spoke about the challenges of trying to teach a class of 60 students with no standard curriculum, no books, and barely anything, but benches and a blackboard in the classroom. They spoke about the challenges of getting girls to come to school on a regular basis. And, they also spoke about the challenges of getting higher level degrees for themselves which would, in turn, help their students. The most interesting part though was that they were not saying these things to complain or for us to feel bad for them (I don’t even know if the concept of complaining exists in Ethiopia.) They wanted us to understand that were able to achieve success with their students even without any real resources. This helped us understand how much more they could do if they actually had some quality supplies and resources to work with. As they each told their stories and shared their hopes and goals for their schools, there was an excitement to their tone and a spirit from within that assured us that they were doing whatever it would take to help their students and school be successful. At each school, after we spoke with the principals and teachers, we got a tour of the classrooms and the resources that were available. My mind was truly blown by the innovation and ingenuity that the teachers used to create resources for their students. In a strange sort of way it almost made me disappointed in myself and all of my teacher friends who regularly complain about the lack of resources in US schools. If these teachers could do so much with so very little, we had no excuses for not making more out of what we have. While we saw innovation in every school we visited there were two specific instances that literally brought tears to my eyes. They were not tears of sadness or even tears of joy; they were tears from overwhelming inspiration. We met one science teacher who showed us his “science lab”. Most anyone from the US who walked into that room would have seen some broken glass, a dusty old microscope, and some woven material and scraps with no seeming purposes. As we asked the teacher to describe what he had in his lab, his face lit up. He explained to us how he used old buttons and twine that he had fashioned into a model of a molecule. 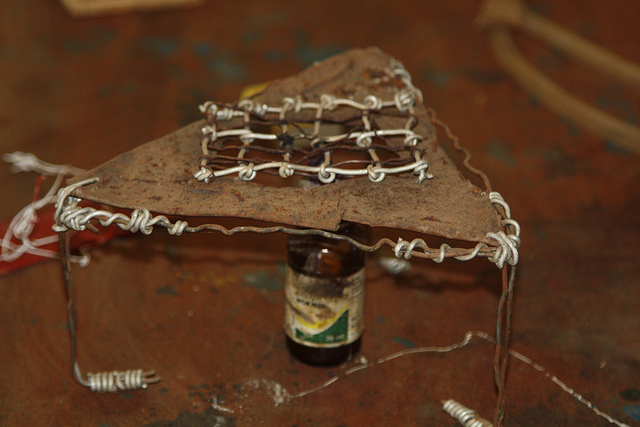 He had also created a modified bunsen burner out of some leather, wire, and scrap materials he had found. He understood that the school could not afford this type of equipment, so he figured out a way to create models for his students to learn from. It was obvious how much pride he took in what he created. It was also obvious what this dedicated teacher could do if we provided him with quality teaching materials. The other impressive use of innovation was in the learning resource room at another school. When we arrived there were five teachers copying diagrams and pictures directly out of the limited number of textbooks they had. These freehanded diagrams and pictures were far superior to many of the educational posters and visual aids I have seen in schools in the US. As is typical with Ethiopians, they were extremely humble when we praised their work. I could only imagine how much time they must spend each week creating these materials. I thought about what these teachers would do with their extra time if they didn’t have to spend hours drawing and creating posters and other learning materials. This is when the value of Roots Ethiopia’s work truly hit me. By supplying schools with additional, much-needed resources, teachers could spend more time doing what they do best – teaching children. What a simple, but challenging concept in these schools. Giving teachers the resources and the time to effectively teach could have an enormous impact on students’ learning curve. I look forward to focusing the majority of my Roots energy on these ideas and making sure the resources and time have a measurable impact on the students and their schools. Next Next post: Top 10 Reasons We are Headed to Ethiopia This Week!